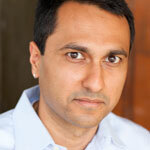 Commencement: Eboo Patel, a leading voice for interfaith cooperation and the founder and president of Interfaith Youth Core, will deliver Wake Forest University’s commencement address on Monday, May 16. The ceremony will begin at 9 a.m. on Hearn Plaza. 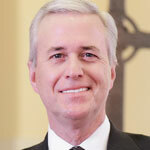 Baccalaureate: The Reverend Dr. M. Craig Barnes, president and professor of pastoral ministry at Princeton Theological Seminary will deliver the baccalaureate address on Sunday, May 15. The ceremony will begin at 11 a.m. in Wait Chapel. Commencement is a private, ticketed event. The news office will issue a separate media advisory with logistical details for commencement weekend. Media and photography passes must be reserved by Friday, May 8. 67% of employers say they are planning to hire recent college graduates this year, up two percentage points from last year and the highest proportion since 2007. Leadership, team building and communication skills are three of the top attributes employers want to see on new graduates’ resumes in today’s workplace and for the future. But how do newly-minted grads prove they fill the bill? Student: Anthropologist lands tech sales position — After three years building a resume for grad school, anthropology major Caroline Bertoni changed course, deciding the workplace would be a better choice. Fall of her senior year she applied for 20 jobs – each time honing her ability to tell the story of how her data analysis skills, writing talents and cultural understanding would add value to the workplace. During her interview at Lenovo, she embraced her major and offered a sales proposal showing which of the company’s products would help support anthropologists in their fieldwork. She was offered and accepted a position with the company in Raleigh, N.C.
What are grads looking for in their employers? It’s not uncommon to hear what employers are looking for in grads, but what are grads looking for in employers? Student: From refugee camp to Abercrombie & Fitch — Economics major Muggs Ibrahim is headed to Columbus, Ohio, to join Abercrombie & Fitch as a business analyst. Muggs’s family fled from Afghanistan to Pakistan when he was five years old, and though the family had lost hope of coming to the United States after 9/11, their application for political asylum was approved. Muggs has attended Wake Forest as a Magnolia Scholar — a program that provides funds and support for first-generation college students. He chose Abercrombie & Fitch for its corporate culture and leadership development program for new hires. Internship experience gives new grads a competitive edge. Sixty-three percent of graduating seniors have had at least one internship and seven of 10 interns are offered full-time jobs by their employers, according to internships.com. Expert: “More career development offices are focusing on getting students internships and connecting them early and often with faculty, staff, mentors, alumni and parents who can help them identify their interests and strengths. Internships are key to helping students make the transition from college to career,” says Andy Chan, vice president of career development. Student: Internship key for new L’Oreal employee— Emily Bandyk found marketing was her calling. She also fell in love with art. As a business major and art history minor, she followed both her head and her heart. In business school she worked on a case study transitioning L’Oreal’s Plentitude line in France to appeal to American women. By networking with a Wake alumna and promoting her hands-on case study experience, she landed a summer internship at L’Oreal. Six months later, she was offered a full-time position working on the company’s luxury division in New York. “I landed my pie in the sky shoot for the stars dream job,” Emily says. Ally Kaminsky from Clemmons, N.C., worked with computer science professor Paúl Pauca to develop a hands-free communication device that could help millions of people with speech impediments and poor motor control interact with the world around them. Read more about her Wake Forest research here. She will be attending grad school in the fall to earn a PhD in computer science. Addison McLamb is one of 111 to join the inaugural class of Schwarzman Scholars selected for the master’s degree program at Tsinghua University in Beijing, China. A Lexington, N.C., native, McLamb, who majored in Chinese, is also an Army Reserve Officers’ Training Corps (ROTC) cadet who recently captured the number five spot on the national Order of Merit List. When students move out of residence halls at the end of the academic year, Wake Forest partners with Goodwill to collect items for the community. Students donate truckloads of items to Goodwill through the DEACS Donate program. 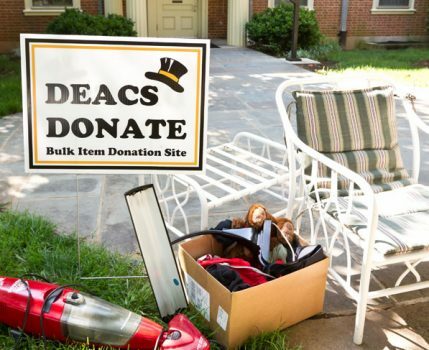 Organized in cooperation with the Resident Student Association and Residence Life and Housing, DEACS Donate makes it easier for students to recycle clothing, small appliances and household items they plan to discard. Last year, they collected more than 20,000 pounds of donated goods. Wake Forest and Goodwill volunteers will pick up collected items as needed through May 6 and again after commencement ceremonies conclude. Students are also encouraged to recycle textbooks they can’t resell, paper they’ve accumulated through their coursework and to save their green recycling tote to use next year. Learn more about other graduation related recycling efforts here.